Mincemeat with brandy and ruby port. 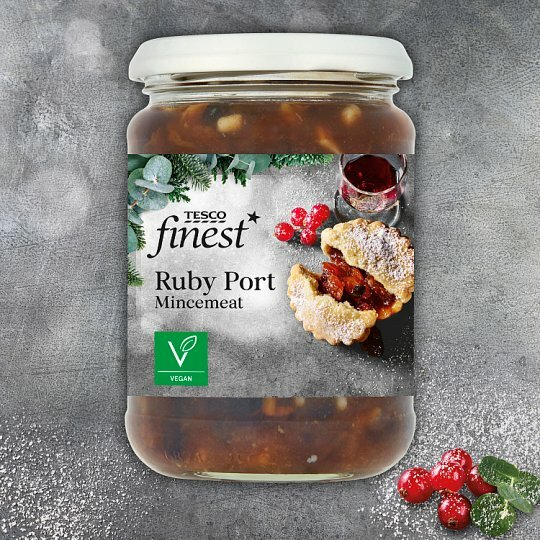 INGREDIENTS: Vine Fruits (34%) [Sultanas, Raisins, Currants], Sugar, Bramley Apple (18%), Glucose-Fructose Syrup, Glacé Cherries (5%) [Cherry, Glucose-Fructose Syrup, Sugar, Radish Concentrate, Carrot Concentrate, Cherry Concentrate, Sweet Potato Concentrate, Apple Concentrate], Ruby Port (3.0%), Brandy (3.0%) [Brandy, Colour (Plain Caramel)], Palm Oil, Orange Peel, Treacle, Preservative (Acetic Acid), Lemon Peel, Sunflower Oil, Cinnamon, Coriander, Acidity Regulator (Citric Acid), Dill, Fennel, Clove, Ginger, Nutmeg. Store in a cool dry place., Once opened, keep refrigerated and consume within 6 weeks.